Captured by the 47th Royal Marine Commandos the morning of D-day +1 entering from the south along the main road. By D-day +6 the port was reopened with off loading of about 8,000 tons per day. 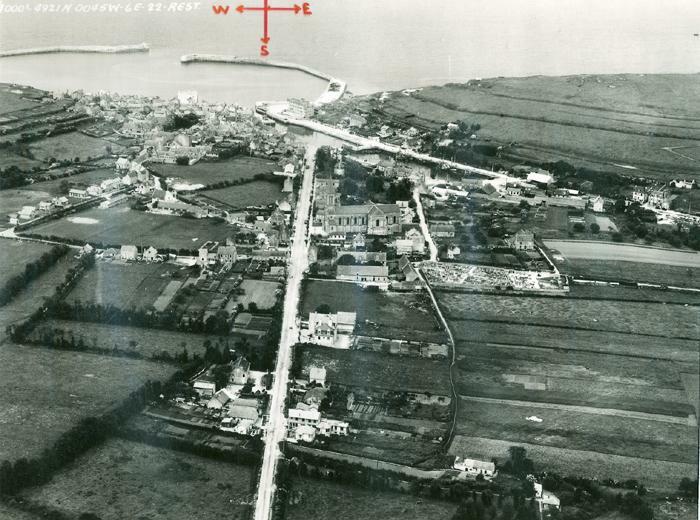 In early July floating pipelines connected fuel and oil tankers to the large petrol dump immediately west of the town. The German pill boxes on the west and east headlands overlooking the harbor and its approaches are still present. The commandos cleared the town quickly and continued westward to link up with the American forces moving eastward from Omaha Beach. The four storied building on the east side of the port entrance was demolished in the making of the movie “The Longest Day”, 1963.